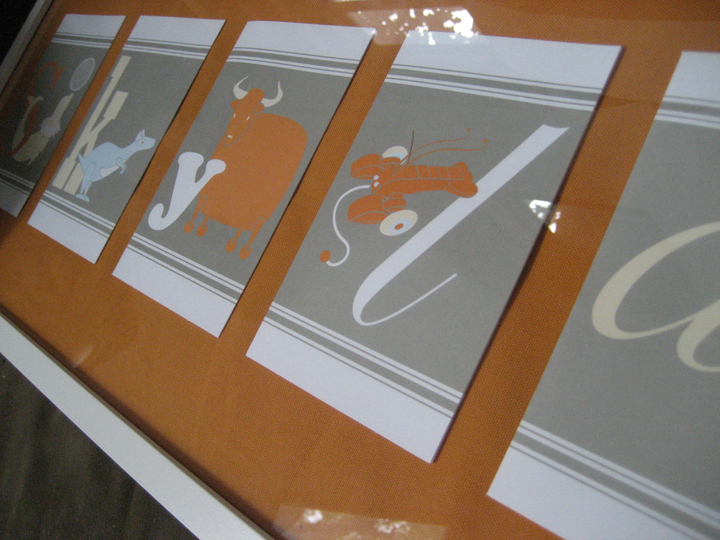 Way back in May I found this adorable set of Alphabet Cards at Sweet Charity in Brooklyn. (adorable shop, you must stop by). I was in NYC with the girls, and as soon as I saw the cards I knew I had to have them. The box contains 26 cards, one for each letter (duh…). I had an idea in my head to take the six letters in Daughter’s name and frame them somehow for her play area. It wasn’t until my most recent Ikea trip (they’ve been weekly lately, unfortunately) that I put all the pieces together. I grabbed one of the long and thing Ribba frames (meant for five 5×7 prints) and cut a piece of the beautiful Orange Minna fabric and it was done! Now I just need to persuade someone to hang it up for me and it will be complete. great idea! will ask to see it in person next time i am over. I love it! Is that a Cooper Black “y” I spy?